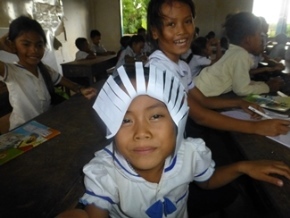 Who Care With Vulnerable Children - CHAB Schools, Siem Reap? What We Do in Siem Reap, Cambodia? This is the report of CHAB schools that have educated and supported 290 vulnerable children in the rural village since 2012-2016. Some got a good job and a good life and some left CHAB school because their parents moved and migrated to live other place in Cambodia. 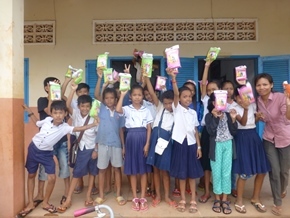 CHAB works in disadvantaged communities to establish schools in rural Siem Reap in Northeast Cambodia, giving underprivileged children a better start in life. Through your support, Project CHAB 2017 collected and registered many more children. CHAB gave them opportunities they never had before such as free education, important health care and school care for children. These children can learn and play. They can make friends and grow in a safe and happy environment. What differences would you like to see in these children? There are 115 children, 31 males and 82 females who have been educating, training at CHAB schools. The expect of CHAB is these vulnerable children will grow up and become responsible adults able to make a positive contribution to their community. those children escape from poverty. Children Who Continued To High Schools There were 37 children, 23 males and 14 females who continued to high schools in Siem Reap, Cambodia from 2014-2016. “CHAB schools give children a place to play, laugh, learn, make friends, and do all the things a kid should do. Most importantly, CHAB schools give them a place where they know they’re not alone anymore." When every child has the chance to play and learn, and schools are safe and supportive, it becomes possible to ensure that all children fulfill their potential. 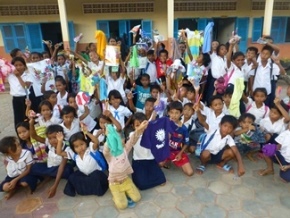 CHAB school has helped improving lives and a better future for many children in the countryside villages of Siem Reap. CHAB works in the countryside because wants to hear the needs and issues of children live in difficult situations and address the problems of children directly. 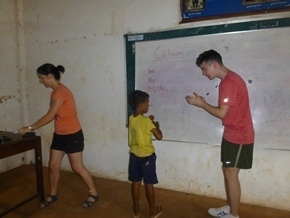 CHAB offers a range of free classes to the vulnerable kids at CHAB schools and works with children and local community in the other rural village. We provide a high-quality learning opportunities free of charge to those who cannot afford extra schools at private language centers. 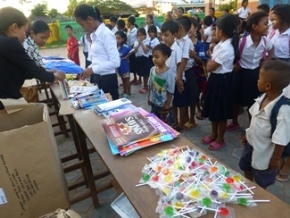 CHAB creates free- schools in the poor countryside villages and works on long term projects of Siem Reap province to provide free education, skills for employment and support to children of poor families in the countryside. Our schools have achieved the great progress in continuing its work on providing security, free English classes, art classes, school materials (clothes, books, pens and pencils), rice support to their families and love to all children from the poor countryside families and empowering them to achieve their full potential. CHAB is currently managing a range of improving life skills for employment (free English classes) aimed at ending poverty. Make sure our teacher can teach needed supplies (books, stationaries, etc), making learning fund and interactive for our students!! See much needed supplies are facilitating learning and creative development of our young kids through an end of term reports. Give the gift of education along with the life skill and teacher development to complement it. · Teaching materials like books or stationeries. · Class room, IT and library resources like maintenance, interactive learning tools etc. · Hygiene training like general and oral. CHAB's school is the free education and works in the remote villages to help build a new future for poor countryside students and children. The purpose of CHAB's School is to give rural students a chance to find a future employment; CHAB's School was established to provide an English language skill and build a vocational skill to students in need for their job opportunity in the future. 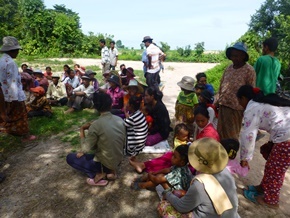 The school has 3 classrooms establishing built in 2011 in a small village East of Siem Reap, has met immediate success. CHAB's students are free selected and registered every day, week, month and year from the age of 10 for young students from the rural areas of Siem Reap province. 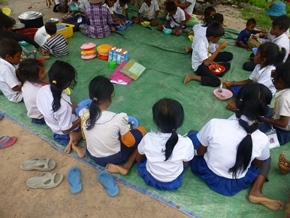 Most come from large, rice-farming families and have siblings attending government schools. Living in traditional build wood or straw houses in small villages with tight-knit communities, they are quite familiar with rice farming methods and many have chores to do in addition to their school work. Through a globally competitive education our goal is to teach and nurture our students into thoughtful, effective communicators in English for employment options. They are primed to think of themselves as the future tour guide, English teacher and employee in hotels, tour companies or restaurants of their country, and are whole-heartedly supported in their aspirations and dreams by their families, their teachers and the entire CHAB community. The kids of pre-Kindergarten from the age of 5 are allowed to get free education at CHAB’s school. The school uses the reading program. Children begin with phonological and phonemic awareness. They learn the sounds and shapes of the alphabet and become familiar with reading strategies such as predicting and responding to comprehension questions. There is a strong focus on English language acquisition in the first formative years of CHAB. · Teaching materials such as exercise books, stationeries etc. We support our students by providing everything they need to succeed at CHAB’s school. 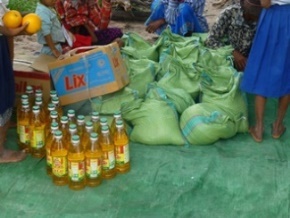 They may have few resources at home, so we supply them not only with all study materials, but also practical requirements like some clothes, as well as hygiene supplies.